What’s the best way for businesses to give back? With increased exposure and scrutiny brought about online, it is quickly becoming more and more essential for businesses to fulfill not only their financial goals, but implement social initiatives. More so than those between 35 and 44 years old, the younger generation revealed they were more inclined to buy products from a company dedicated to giving back. A survey of more than 2,000 individuals conducted by Morning Consult for Fortune found that nearly two-thirds of millennials say they prefer companies that make cash contributions to charity or have other philanthropic programs. Committed to making a deeper difference in the business world, Hustle Humble sets out to inspire the next generation of movers and shakers. With every purchase of their subscription box dedicated to boosting small businesses, Hustle Humble lends a hand to children in need. 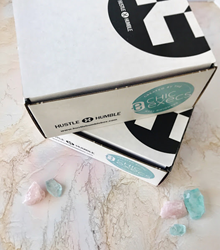 Constantly finding creative ways to stay connected, Hustle Humble hosts quarterly networking events and offers a monthly subscription box with best practices for entrepreneurs. Not only do they encourage traction on social media with the use of a curated hashtag to mark each event, the team includes crucial elements such as speed pitching to different brands which gives real hands-on experience with experts, as well as an innovative spin on the regular meet and greet. The two-fold name Hustle Humble has a significant meaning to founders Kailynn and Nikki. When they started their first company 13 years ago, they “hustled” around the clock to accomplish their goals. More than speed, it was about producing quality work. With the help of the Lord’s grace and guidance, they were able realize their dreams. Above all, these self-made women keep their ethics while remaining humble through all of their blessings. As of 2016, their expanding enterprise includes Chic Blvd, ChicBuds and ChicExecs.